Holy basil ,Tulsi is a sacred plant well known for its Spiritual and healing abilities. Its adaptogenic nature lowers cortisol and combats with body’s negative response to stress & anxiety. It is good for the heart ,helps to keep it healthy. Holy basil ,Tulsi is a sacred plant well known for its Spiritual and healing abilities. Its adaptogenic nature lowers cortisol and combats with body’s negative response to stress & anxiety. It is good for the heart ,helps to keep it healthy .Tulsi removes congested mucous from the throat & lungs ,keeps the chest area light &healthy. 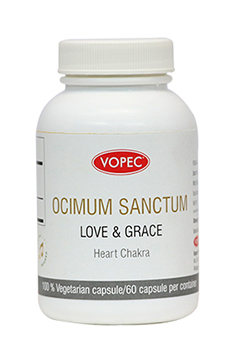 It’s a cardioprotective herb provides significant protection against damaging effects of chemicals. Thulsi also helpful in Diabetes to keep the blood glucose under control. Its antioxidant activity help to combat with age related memory conditions like dementia & alzhiemers. Tulsi can absorb positive vibrations from the surroundings and ward off negative energies including harmful radiations. Protects against damaging effects of environmental radiation. Love & grace contains sacred herb Tulsi additionally infused with siddha’s sound vibrations mentioned to activate connection to god through love. Love & grace aids to get more love ,care , generous mentality & confidence.